I had no particular expectations about Peter Capaldi as The Doctor, because the actor and the character so often have little in common. I mean, take David Tennant adopted a different accent and before Who his hair wasn’t so flamboyantly coiffured. I wanted to take the new Doctor as something of a blank slate. Deep Breath offered an unexpected experience in that respect, as I found myself genuinely struggling to understand anything Capaldi said for the first 10 or 15 minutes. Maybe I’m just getting old and decrepit or something. I’m ready to consider that the failings of age might go some way to providing explanation. Perhaps my problem is a combination of Capaldi’s accent and the incidental music? I definitely got the ‘jump on’ vibe – the sense of revisiting some basic principles just for the benefit of new viewers. At the same time, the script and plot contained plenty of elements suitable for fans – both of the Classic Who period and the 21st century rebirth. The Clockwork Robots were obviously not simply a nod, but an out-and-out connection to the much-loved episode, The Girl in the Fireplace. I found the difficulty suffered by Clara in taking onboard the regeneration a struggle to empathise with. No one seems to have gone through this much trauma before – even Peri, who in waking to find the Doctor regenerating into Colin Baker was promptly set upon and strangled. She adjusted remarkably well. Deep Breath has a slight feel of The Christmas Invasion, with The Doctor taking to bed, recovering from his regeneration. Capaldi harnesses the bewilderment common in so many post-regeneration Doctors, new and old. I like Strax, though he undoubtedly must have a Jar-Jar/Marmite-style following amongst viewers. Sometimes, the humour hits the mark; other times, you have to wonder why Moffat has singled the Sontaran out for ridicule… I mean, they’re already a race of short, potato-headed clones. Do they need more piss taken out of them? In some respect, now that I think about it, the fight between The Doctor and the Almost Man was rather similar to the sword fight between Tennant and the Sycorax Leader in The Christmas Invasion. The combatants battle close to the edge of the abyss and we have genuine doubts as to whether the Time Lord has it in him to not only win the fight, but also to put an end to the threat. Both adversaries spiralling to the ground… well, if anyone labels The Doctor out as cold for this act, it begs comparison with Tennant as setting the precedent. I’m ready to continue watching and see how this pans out. 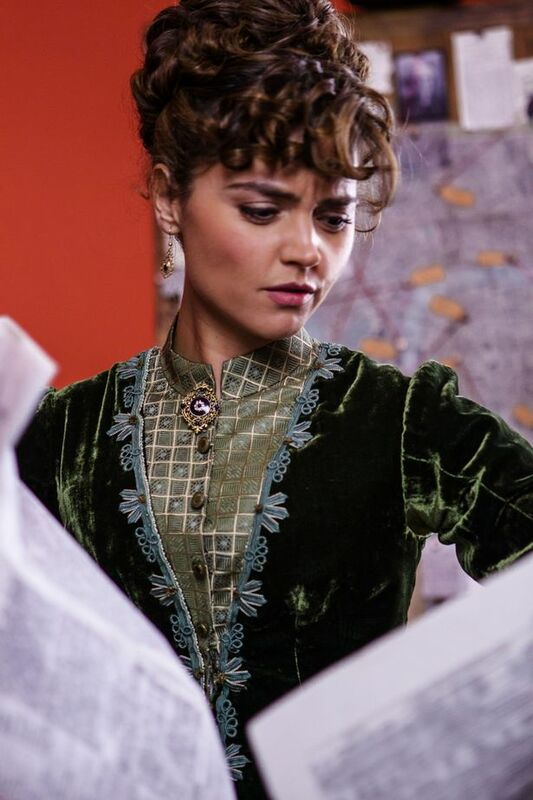 Moffat has piqued my interest with Missy, as I’m certain it’s meant. I’m thinking something to do with River and her Virtual Tomb in the Library. This entry was posted in Current Doctor, Review on September 2, 2014 by Paul B.